One of the things my husband and I love most about Summer is having grill-outs, entertaining and having friends over, and making fun drinks to cool down from the hot weather! As Summer approaches, I was thinking about how I don't have any fun dinnerware to serve food on this summer...you know, something that just screams fun and summer the minute you see it. And then, as always, BrylaneHome read my mind and had exactly what I was thinking of: 16-piece Santa Fe Hand-Painted Striped Stoneware Dinnerware. They always have great products for entertaining and decorating for any season and they have always have a great selection of home products! I love the bright summery colors of the 16-piece Santa Fe Hand-Painted Striped Stoneware Dinnerware that I received from BrylaneHome! 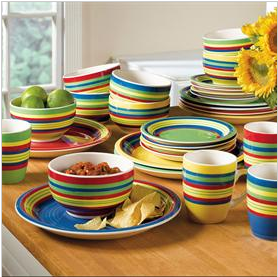 This matching set with green, blue, red, and yellow stripes will liven up your kitchen countertop and dinning table with a touch of southwestern flair at a great value. It is beautifully hand-painted and is sturdy and well made! It will be perfect for serving grilled food, summery salads and fresh fruit on this summer to guests and family! One of my goals this summer is to make homemade Sangria. When I make it, I will have the perfect thing to make it in: the Santa Fe 98-Oz Stoneware Pitcher. It matches perfectly with the Santa Fe Dish Set from BrylaneHome and can also be used for so much more this summer like tea, ice water, juice, or any other favorite drink! Hand-painted and designed in southwestern solids or stripes it brings out the best in your dining set and matches perfectly with the rest of the Santa Fe set. Hand wash only to keep it the pitcher of perfection. And when I make the Sangria, I have the perfect glasses to serve it in: the Santa Fe Hand-Painted Striped Wine Glasses. I love that they match perfectly with my other Santa Fe dishes and the bright colors are perfect for serving a fun and tasty Sangria in! This set of southwest style wine glasses brighten up any kitchen and are perfect for casual dining and entertaining. This set is comes as a set of four 14-oz wine glasses and are hand painted! Drinking a nice, cold, and tasty glass of wine or Sangria from these bright and fun wine glasses will be a perfect end to any summer day! So if you like to entertain during the summer and are searching for the perfect set of summery and bright dishes to serve your favorite summer meals on, you will LOVE the handpainted Sante Fe dinnerware set, pitcher and wine glasses from BrylaneHome! includes: (4) 10¼'' dinner plates (4) 7¼'' salad/dessert plates (4) 20-oz. bowls (4) 10-oz. mugs) to a lucky winner! These are all lovely pieces. Absolutely perfect for a Mother's day gift.